From the advice I've received, I have added another three Pokemon for 6 vs 6 battles. Bronzong, Weavile and Starmie will be used in 3 vs 3 battles. Forretress is basically there to set up Spikes, get rid of those set by the opponent and to kill off any Bug Pokemon that Weavile and Starmie hate. Will the Occa berry do much in helping Forretress survive a Fire attack? Forretress is a physical wall, nto a special wall. Gyro Ball > Rock Slide for damaging move. A few Atk EVs are nice for boosting Gyro Ball and Explosion, and Forretress has a base 140 Def. If you're facing a Fire move, I would advise you to switch. Watch out for Taunt/SR leads, as it's quite obvious Forretress wants to Spike. As I mentioned earlier, I hate the unreliability of Hypnosis and Stealth Rock doesn't do much in 3 vs 3 battles, so I can make Bronzong into a screener. You might consider a different moveset for a 6v6 team - possibly training 2 Bronzongs (or cloning one). Stealth Rock is very useful against human opponents, and you don't suffer Battle Tower luck either. The EVs allow it to do some decent damage against fast sweepers, who cannot do much to Bronzong with screens up. Screen Bronzong normally has Explosion, but you have Forretress already, so I would recommend considering Stealth Rock for extra switch damage. [color=yellow]Standard, except for the Illuminate ability. Again, I strongly suggest you include a sweeper that has a stat boosting move. If you want Weavile to be Banded, consider a Nasty Plot special sweeper. Using three sweepers that cannot stat boost is asking for a tank to stat up and sweep your team. Healer and Forretress/Scizor killer. Serene Grace to boost the chances of burning the target. You might be able to get Scizor + Forretress by surprise. If you switch Blissey into a Scizor Swords Dancing, it may just OHKO you with Brick Break. Blissey with Flamethrower and Charm is not a very reliable counter to CM Suicune or Latias. After a few CM, neither is Starmie with Thunderbolt / Ice Beam. You might consider the CM Bliss set, which has better attacking options and shuts down Calm Minders. You won't have Flamethrower for Scizor, but as mentioned earlier, Blissey won't survive a Scizor if it has a Swords Dance anyways. I wish I had bred some egg moves such as Counter or Fake Out to Weavile, but he is almost at Lv90 and I'm reluctant to "start over". Forretress, Gengar and Blissey have yet to be "created", so don't hesitate to make any dramatic suggestions now. I think my team might need another bulky Pokemon. Other Pokemon that I have considered for my team include Claydol, Armaldo, Lucario and Togekiss. As mentioned earlier, you should get a stat booster. You have three bulky pokemon, but if you want another consider tanks like Snorlax and Suicune. Note that Blissey is not a very reliable Scizor counter to start with - and if your opponent knows your team, even less of one. Yes, Blissey is a nice pokemon to switch Scizor in on - but then, so is Forretress and Weavile. Reflect can give Starmie a good chance at killing it unless Starmie is at low HP. SD Lucario can also cause problems if your opponent Pursuit kills Gengar (who cannot be killed by ExtremeSpeed). I suppose I should mention this as EP hasn't been around lately. Everyone welcome Sion9 and Electrike! as newest raters to the rating center!! Last edited by MasonTheChef on Wed Jul 29, 2009 5:47 am, edited 1 time in total. I'll deal with the 6 vs 6 team first. Sorry for redesigning the team again and again, but I could see so many holes in my previous plans. What about the following team? Sets up Stealth Rock and puts opponent to sleep prior to switching out. Revenge killer. Starmie has Ice Beam, so Weavile gets Night Slash for better coverage. I need a Scizor counter, because I've often ran into situations where my Starmie and Weavile get OHKOed by X-Scissor. Heatran is an alternative, but I really don't like the look of the 4x Ground weakness. Putting up with Weavile's 4x Fighting weakness is annoying enough. Roost rids the boltbeam weakness, but is Flamethrower a must to kill of Scizor/Forretress before they kill the paper plane instead? I could hit them with Aura Sphere instead. Rapid Spinner. Calm Mind to boost SA and SD, Grass Knot to kill bulky waters. Calm with Shadow Ball, Careful with Pursuit. PP-Drainer to force more switching in and out and damage them via Bronzong's Stealth Rock in the background. Pursuit will land a nasty hit on those trying to switch out (max base power plus STAB is 120), but I think I need Shadow Ball (usual base power plus STAB is 120) for better coverage, since Weavile has Pursuit and Night Slash already. Shadow Ball may also lower the opponent's SD, which is an added bonus. Location: What, you want directions or something? Looks alright, but if you want to really do some damage after setting up SR go for Explosion over Earthquake. Since you have a spinner, using Focus Sash could work and allows Weavile to stay alive. Getting stuck on Pursuit can be a pain, too, with Choice Band. Life Orb will increase damage output and allow you to switch attacks. Taunt will help kill walls. Choice Band works anyway, though. It's mainly preference. I love this set. After a couple of Air Slashes from Nasty Plot-boosted Special Attack, Scizor and Forretress should be going down. Life Orb adds power and you can use Roost to recover the recoil. Looks alright, consider Shadow Ball though, Claydol will die to water-types if it doesn't have enough CMs up. I see why you would use Spite, but really, you can't do anything if you're in against a Normal-type. This could just cost you a match. Try Hidden Power[Fighting] for perfect coverage. Or you could keep Spite and use Dark Pulse because nothing is completely immune to it. TRADING LEGIT MOVIE ARCEUS! PM ME WITH OFFERS! Avatar made by my friend from another forum. No stealing. Last edited by Electrike! on Sun Aug 09, 2009 6:33 pm, edited 1 time in total. Basically I've created this team for the battle frontier, so it's gonna be 3 Pokemon. Basically, Uxie's job is to use Stealth Rock, put the opponent to sleep and switch to Ninjask. Psychic could be used if the opponent is weak to Psychic. Its EV spread it to maximize its defenses so it can survive attacks while it sets up the rocks and yawns. So basically he'll be the second Pokémon in my Battle Frontier party. His job will be to accumulate speed boosts and swords dance. Then he'll use substitute and baton pass to power up my mixed sweeper Salamence. I was wondering if double team was a better choice than substitute because the sub usualle doesn't last with powerful attacks. I think that a Focus Band is useful so Ninjask can baton pass a maximum of boosts to my sweeper. Salamence is here to sweep, anything that comes in. With the attack and speed boosts from ninjask, he can easily counter any Pokemon even Garchomp, Blissey and any other Tank or Sweeper. The Life Orb is here to boost his powerful attacks. As for his EV, they have been chosen to maximize his attacks. With a team like this the battle frontier will just have to give me theses badges. Uxie will put to sleep, Ninjask will generate stat boosts, Salamence will sweep. Stealth Rock isn't very useful in the Battle Frontier, since your opponents have 3 Pokemon and won't be switching much. I would try using the tanking Uxie above. This one sets up with Calm Mind and is able to sweep on its own. Psychic and Thunderbolt are resisted by very few Pokemon. The support move is preference. Yawn is helpful to get your opponent to sleep while you set up, attack, or switch. The EVs look odd but they allow Uxie to outspeed CB Heracross and Adamant Lucario and survive attacks from Gengar and Heracross. Substitute+Protect combo is perfect for stalling to get Speed Boosts. Liechi/Petaya Berry to pass to Uxie or Salamence. This Ninjask is also a good lead, so you may want it as your lead. Well, because of the changes I made to Uxie, you can use a Physical Sweeping Salamence here. Dragon Dance could be unnecessary because of Ninjask, so Roost might fit better there. Stone Edge is just another physical attack. its been a loooooong time since i've played pokemon, or even constructed a team. NU looks like fun, so why not?! a skull mask and a bone for a weapon? charming lil devil. after two SD's passed from leafy, marowak is sure to pose a massive threat. granted his speed isnt the best, he'll be hitting hard all the way till the end. this bad boy holds down the fort. he makes sure everyone gets a wish here and there, and can paralyze the opponent, all the meanwhile setting up the sunny-beam combo. if a fire type tries to get fresh with him, out comes Ninetales, absorbing the possible fire attack AND getting a very nice boost from sunny day. pretty standard special wall. im not too thrilled on using probopass, but i do like his mustache. so there it is, my try at a triumphant return into competitive play in the NU environment. thanks in advance! You did not specify where this team will be used; I will rate as though it is competitive, as you can always use competitive sets to great effect in-game. That is the standard Mixed Sweeper set for Electivire. It threatens physical walls as well as dealing physical hits. You can do enough damage to a physical wall that switches in to allow another physical sweeper to sweep. ~ Earthquake / Fire Punch. However a physical wall without a type weakness will easily wall you. Note: Electivire is best used as a switch in after an Electric lure, such as Gyarados, to power up Motor Drive. As such, I would advise you to use a Gyarados on your team (or other Electric attack lure) for the best benefits. Additionally, do not lead Electivire - you lose the element of surprise necessary for Motor Drive activation. 1) Blast Burn, or any Hyper Beam moves for that matter, is highly inadvisable because the opponent gets a free turn afterwards. 2) Using two attack moves of the same type is generally ineffective, and serves no purpose here. ~Signal Beam - Dig is not very useful on an Espeon. As mentioned above, Frenzy Plant should be removed for 2 reasons. Replace it with Swords Dance or Rock Polish to boost up for a sweep. Garchomp is best as a physical sweeper. Giga Impact is not used for the same reason as Hyper Beam. Note that Return has greater power over 2 turns than Hyper Beam. Here, Dragon Claw and Outrage can be used because in some instances you will want to be able to switch the next turn. Outrage still allows attacks the 2nd turn, unlike Hyper Beam. If you are only using Garchomp in-game, and feel no need to have 2 different Dragon moves, use Crunch to replace one for type coverage. Close Combat works well against common special walls such as Blissey and Snorlax. As a competitive team, you need to add walls - Torterra is somewhat bulky, but a pair of dedicated walls will benefit you greatly. Location: Wherever you want me to be. Just a sweeper and it tends to work pretty well. Normally my lead poke, too. I have two of them, one with waterfall replacing posion jab and a Scarf, and the other is this one. Originally for a Trick Room team, but it seems to work well on it's own. Signal Beam and Power Gem work really well for me, normally getting at the most 2HKOs. He was intended to be a wall but his Sp. Attack was enough so that he has gotten a few victories for me. Static works really well, too. This one was just to annoy people and give me time, but Psychic works pretty well on Fighting pokemon like Infernape if he can survive a hit. I haven't tested Focus Blast yet, but I cant decide between Attract and Focus Blast. This can make battles really long and it has Stealth Rock on it. Because of his speed, I could use metal burst, but Iron Head works really well. Iron Defense is if I they use Dragon dance, or anything like that. Protect is what I use on the first turn to see what they will use. I just use Thunder Wave unless I think I can OHKO, or if SR is up. It's not faster then Choice Band Sharpedo, but it is pretty fast. Normally Thunder Wave works out pretty well, unless they know the tactic. No idea what this will be, probably end up like Ampharos. Really, I need a fire type, but I don't have any to work with besides a Quilava and Earthquake looks like a big threat. Other than that I have no idea what to do with this team...I have already gotten all of them but Aggron. I want to keep at least Ampharos, Sharpedo, and Bastiodon, but other than that I am completely open to changes. Last edited by Meeps on Wed Aug 26, 2009 10:12 pm, edited 1 time in total. Meeps, please add what environment your playing in, in-game/friends or UU/OU. As well as a a short description of what each poke is aiming to accomplish. I ask this because of the rulez and because it helps a lot in helping you figure out your own holes in the team as well as helping us rate. adamant (252 Att/252 Spd/6 Hp)@??? -brick break? or Steel wing? timid (252 Sp.A/252 Spd/6 Hp)@??? I found a chikorita in my box with an adamant nature, and thought it was useless, so buried it in the box, but with hg/ss approaching I thought I would look at the meganium stats... turns out this guy could be fierce, but I'm not sure about the ev spread I planned for it... also should I use this in my 3 pokemon team for the battle tower? The team is entirely very solid NU/UU pokes aside from froslass which is a BL, you may have some problems in OU there but it's possible and can be quite good with same said pokes in UU. Switch nature to modest, and leftovers for an item. With those EV's you can use Subsitute over power gem and tank quite well behind it. Also there's the option of using reflect/light screen + light clay to help defend the rest of the team. Use Thick fat to help his defenses a bit. If you are aiming to annoy and damage try mud slap in the 3rd slot or mirror coat (or better yet counter if you can get it from FRLG) Though if your aim is mostly to attack there then try Focus blast or signal beam. Protect to scout, Curse to up def while boosting attack, Iron def is fine too but it may allude to being a metal burst set and without taunt that can give the opponent a free setup. Shuca will allow him to metal burst back an EQ once, as you have nothing that can safely come in on it. Use Timid nature to become even faster, without SR on the above set you can run spikes over T-wave to set up when froslass comes in to take fighting attacks aimed at bastiodon. No, I ill advise having two rock/steel on the same team, Try running a Glisor or Togekiss w/flamethrower if you want something defensive (and something that can switch into ampharos and bastidon's weakness) This is the link to the SERIOUS BUSINESS page for togekiss Try the Choice spec's set here. Sash counter offensive leads, U-turn their switch in if it's slow or not a priority user, Quick attack/switch if they are. Night slash ghost/psychics if you can, thief may work here with tech if the sash was broken to steal an item. Leftovers and either a substitute in the last slot or reflect is possible since synchronize does "block" status. Go with the gyarados, use waterfall over aqua tail, 10 less power but 100%acc and 20% flinch perform much better. Water/ice give good coverage, U-turn to scout counters and either roost to recover SR and other damage or agility to try a sweep. Try a spread of 252hp, 4 atk, 252spd or 158atk and 100spd and replace outrage with Body slam. Flail or Substitute are also good options there. It's the right place, sorry about the wait. For EVs I did a spread of HP, SP and AT focusing on the latter two. Lots of HP, rest on speed, encore to force the opponent to repeat the move so i don't have to guess whats coming! Last edited by /vXv\ on Thu Sep 10, 2009 5:31 pm, edited 1 time in total. what kind of battling environment the team will be used in (WiFi, Shoddy Battle, PBR, Battle Tower, etc) so that the raters know what limits you have, like accessibility to FRLG/Emerald/Platinum move tutors, Hidden Power types, and the works. If the team is for Shoddy or some other pokemon simulator, you do not have to mention these things; otherwise tell what other games you have access to and how willing you are to breed for Hidden Power, etc. Only post teams that are meant to be competitive - if you cant defeat Cynthia for whatever reason, train your in-game team more. How well this team has performed for you in the past - we don't want to rate a team that hasn't been used before - try it out and see what problems you run into, if any. Heck, if the team does well enough for you that it doesn't need to be rated, that's fine by us. Be sure to mention any specific pokemon you have problems with, the more detail the better. A short description of the pokemon - I would suggest aiming for about 5 sentences, but anything from about 3-10 is fine (1-2 sentence descriptions are unacceptable). Here, describe the purpose of the pokemon - why did you choose this specific pokemon, with this specific moveset, over the other 492 pokemon there are? Mention what the Pokemon's role in your team is - for instance, is your pokemon a Lead, designed to set up entry hazards like Stealth Rock or Spikes? Is it an Attacker, intended to hit the opponent hard with attacks to weaken them? Is it a Baton Passer, giving the key stat boosts to another pokemon on your team that it needs in order to sweep the foe? Is it a Tank, or a Supporter, or a Spinner, or any of the other various roles a pokemon can have? Mention if your pokemon is intended to counter any specific pokemon (for instance, say how Magnezone is your number one Skarmory counter), or if there are any specific pokemon that counter yours (like how your Skarmory's number one fear is Magnezone). Ok, I know that there a ton of things wrong about my format of this post, please don't go to hard on me, it is my first post on the Rating thread. I was thinking about bringing back Curse but I am unsure, I was thinking how im I going to restore my hp when I use it. My Gengar is beast at Elite Four And Battle Tower, but when it gets hit with a ghost, psy,or dark attack its over in one shot. I hope I'm ready to post my team, if I'm not then oh wells. I'm using this team for Battle Frontier. So, theres not going to be stat boosting moves, or attacks that effect the whole team. Only attacks that I can use to land a 1hit KO (2hit KO at the most) I will always go Choice when doing the battle hall. He has always been good through out the whole entire BF hitting everything with nutural damage. He is able to take out any of the Dragons that out speed Garchomp. Chompy here likes to destroy any Pokemon that is weak to any of its attacks. I can switch Outrage for when I go to Battle Hall (only when I go against the Dragon rank). He can also take out Psycics and Ghostys with Shadow Claw. Then the rest is pretty much your average choice set. I also have an all attacking Porygon Z(Tri Atk, Thunderbolt, Ice Beam, and Dark Pulse) and Starmie ( Psychic, Thunderbolt, Ice Beam, Surf). I always need a full attacking Pokemon, with powerful attack and speed. If you can give any modifications that would help with Battle Frontier! 1) It is inadvisable to have multiple choice pokemon on a Battle Frontier team, especially with only 3 pokemon. You cannot change moves until you switch. 2) Switching to a tank when you need to change moves on your main choice sweeper is a lot easier than switching to another sweeper. 3) At higher level battles, you'll find that sweeping is much easier if you can get a Swords Dance or Nasty Plot in. He has always been good through out the whole entire BF hitting everything with neutral damage. He is able to take out any of the Dragons that out speed Garchomp. [color=yellow]I recommend you go with Garchomp as your lead, and replace Gallade with a tank. SD Garchomp is probably best suited for the BF. You may consider Yache Berry instead of Life Orb, as Garchomp has a strong attack already but fears Ice attacks. (In BF especially you are likely to encounter an unexpected Ice attack). Vacuum Wave is standard to attack with priority. Close Combat is another option to counter special tanks; if using Close Combat, use Naive or Hasty nature. You can also consider Choice Scarf instead of Choice Specs, as Lucario's Spe is not the highest. Specs Starmie might be a better special sweeper to use than Lucario; Lucario is mainly a mixed sweeper, with its main threat coming from the ability to deliver a strong attack on both the physical and special sides. As in BF the AI rarely switches pokemon, and will probably send out an appropriate tank only after you have KOed one of their pokemon, having a Choiced Lucario is somewhat of a waste. ^I will follow the advice you've given me for when I go for the golden pass's. This is a double battle tower set I Came up with..
Dragon P. work well on the overly used Dragon types, Psychic gives It an advantage over other fighting types, while Water P. is Super effective verse Fire and Ground but is weaker. Although Rampardos is resonably slow (which is good in this case) even at its slowest it is still faster than a normal snorlax, and a few other commonly used pokemon, using snorlax you lose mold breaker and alot of AT, Rhyperior Is in the middle because its faster than Snorlax, but has higher AT, plus EQ gets STAB boost. 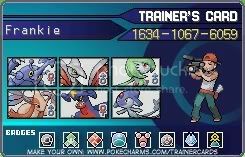 I'm new to this generation of Pokémon, so I wanted an opinion on the first team I made at Lv.50. I mainly use it for Battle Tower and against local friends. I only have Pokémon Platinum and Pearl. Since I have Garchomp and Heracross, I assume my tier would be Overused. The team has performed extremely well against my friends and pretty well in Battle Frontier. But I've been trying to get the Great Ability Ribbon and World Ability Ribbon for a little while now and I'm starting to get frustrated. I know these are almost standard sets, so what can I do to improve or what/who should I consider replacing (please leave explanation)? I also have no idea how to calculate EVs, so I'll try to be as detailed as possible (newb status, i know. Sorry). My three mains for Battle Tower are Garchomp, Gardevoir, Milotic, and then my Heracross would be next in line. Any constructive criticism would be helpful and greatly considered. Thanks! I intended Garchomp to be a Physical Sweeper. I usually start off with Sword Dance, depending if my opponent isn't capable of using Ice attacks. When I know that I can get away with two or three Sword Dances without taking major damage, I'd typically go for it which leads to Garchomp taking out most Pokémon in one hit. If I do see an Ice/Water Pokémon, I typically switch out knowing Garchomp has x4 Weakness to Ice. I use Life Orb to boost his Attack stats as well. He's usually my first in battles. I don't have a problem with this tough guy. I intended Gardevoir to by a Special Sweeper. I personally think Gardevoir's stats were great for being UU. I always try to go for the Calm Mind as the first move. I picked Thunderbolt because I've found it a very useful in my experience for those resistant to Psychic. If I'm low on HP and I haven't used Lum Berry yet, it works as a great combo with Rest. Since after it sleeps to restore health with Rest, the Lum Berry wakes Gardevoir up to go straight back into battle with full health. I was lucky enough to transfer this baby from my Emerald. Sentimental value. I intended Skarmory to by my Tank and Spiker. Since my Milotic is holding Leftovers for Battle Tower, I gave Skarmory Shed Shell to help recover from damage. I tried out this move set and liked it a lot. I'll throw out as many Spikes possible, than Roar almost every turn. Obviously, use Roost when I’m low on HP and Aerial Ace to attack. Aerial Ace NEVER misses! This is great especially when the opponent has used up Double Team to its max. This gives me a reason to laugh in their face thinking they could get away with high evasiveness. Only thing I dislike about Skarmory is that when it's down to the last Pokémon on each side with Skarmory as my last result, Roar/Spikes becomes useless. I intended Heracross to be a Physical Sweeper. Heracross was my main Physical Sweeper until I gave birth to Garchomp. Reason it's still one of my favorites is because it can take out almost every Pokémon in one hit. It's has THE HIGHEST attack points out of all the Lv.50 Pokémon I have for Battle Tower. With Choice Band, it makes Heracross even more devastating. Earthquake is extremely well rounded and Stone Edge is for the flying Pokémon. I usually switch out Heracross when I see a Flying Pokémon anyway with x4 Weakness to Flying attacks. Downfall I hate most about Heracross is with Choice Band I'm stuck with that one attack until I switch out. It gets annoying when my opponent switches to Bronzong and I previously used Earthquake. *shakes fist in the air* Like my Gardevoir, I was also lucky enough to transfer this guy from my Emerald. I intended Milotic to be a Tank. I honestly didn't know what the commotion was all about until I got my hands on a Feebas and evolved it to Milotic. OMG! This baby can take hits. Even against some Electric attacks, Milotic will still be standing (or slithering? haha). Skarmory was my old tank until I made Milotic. She's one of my mains now because she's a great tank that has a great offense stragety. I use Toxic and stall with Recover. Surf and Ice Beam are universal attacks that do decent damage to major damage regardless of type. Also, Milotic is great against Dragon types. I can’t find too many flaws for this beauty. I intended Azelf to be a Physical Sweeper. Its Attack stats are moderately good, in my opinion. I rarely use Azelf in Battle Tower, but I use it quite often against my friends. Choice Scarf to make sure I get the first attack with Zen Headbutt or Fire Punch. I'll use Explosion if I feel that I'm stuck in a corner. The expression on people's faces after seeing an Azelf explode is priceless and effective. And I'll use U-Turn when I feel like I can do a hit and run knowing that Azelf will be useful later. Downfall, like my dislikes to most scarves, I'm stuck with one attack until I switch out and its Defense isn't that great to go against some OU. I'm new to this generation of Pokémon, so I wanted an opinion on the first team I made at Lv.50. Normally, all posters in the Rating Center are required to have been registered for at least two weeks and have a post count of at least 25, but I'm impressed by your already good post quality, so I'm gonna let you get a free rating. So if any raters aren't busy, y'all can go ahead and rate Charizard1stEdition whenever you get the chance. I know these are almost standard sets, so what can I do to improve or what/who should I consider replacing (please leave explanation)? I also have no idea how to calculate EVs, so I'll try to be as detailed as possible (newb status, i know. Sorry). My three mains for Battle Tower are Garchomp, Gardevoir, Milotic, and then my Heracross would be next in line. Any constructive criticism would be helpful and greatly considered. We have an EV guide in Victory Road, as your pokemon are level 50 I recommend you read it and change your EVs. Note that Life Orb typically runs Jolly nature for extra Speed. However, Adamant is a good nature so you don't have to rebreed if you don't want to, especially as you're in the Battle Tower. Outrage is sometimes used over Dragon Claw; if you find yourself Swords Dancing multiple times an Outrage can probably sweep the opponent. Stone Edge is often considered over Fire Fang for higher damage and type effectiveness against flyers. Due to the Battle Tower's lack intelligence on when to switch pokemon, Gardevoir is a great pokemon to bring out against an enemy special sweeper or special tank and Calm Mind up while absorbing hits. I can understand the use of Rest/Lum due to Item Clause, but I would actually recommend Chesto Berry as Rest will clear out any other status besides Sleep in any case. This allows your first use of the Berry to wake you up. Because Battle Tower opponents don't switch much, I wouldn't actually recommend using Skarmory in Battle Tower. You can Spike and phaze, but opponents won't take switch damage unless you force it. As you noted, when it's down to the last pokemon Skarmory isn't very helpful unless your opponent is a physical sweeper that Skarmory can tank, which is a problem in a 3v3 battle. In any case, you should replace Skarmory's attacking move with Brave Bird or Drill Peck. Brave Bird is stronger and usable with Roost, Drill Peck is an option for no recoil. Sounds like you got lucky on random EVs / IVs. You should replace the last two moves to be more effective. Otherwise, your set is rather standard. However, I would not have both Garchomp and Heracross on the same Battle Tower team because it's only 3 pokemon. Yes, if you look at Milotic's base stats, it has a very nice SpD, but it's Def is somewhat lower than a typical bulky water's which is why it was relegated to UU. The Toxic / Recover set works decently in Battle Tower because opponents do not switch, but you might consider using Hypnosis to sleep opponents as well. Your set is almost standard, great job figuring out the U-Turn strategy. The only thing I would change is Adamant instead of Jolly nature for an Atk bonus; with Scarf you'll outspeed pretty much everything anyways after EVs. Overall, your pokemon seem pretty good - just work on their EVs. However a typical Battle Tower team consists of 1 physical sweeper, 1 special sweeper, and 1 tank for balance. However, you may find yourself weak against a strong enemy physical sweeper, because neither Milotic nor Gardevoir have high physical defense. In fact, with Calm Minding Gardevoir on your team, I would recommend a tank more on the physical side, maybe Dusknoir or a stat booster like CursePert. I wouldn't recommend Skarmory in Battle Tower. Last edited by Sion9 on Thu Oct 22, 2009 3:25 pm, edited 1 time in total. My apologies, Registeel_Rocks. I was completely unaware and I appreciate you giving me a chance at a free rating. Also, thanks a bunch, Sion9! The advice will most definitely be taken into consideration. The details you gave are great and easy to follow. I'll be looking more into EVs now. You guys are awesome!